Nanay's Trip My Journey and Joys Nanay's Trip Project Preschool Homeschool Project Raise A Reader raising readers World Read Aloud Day Read Aloud and Play Around Day, Achieved! Read Aloud and Play Around Day, Achieved! We decided to celebrate this year's World Read Aloud Day in the park. Rio chose two books for our read aloud date with his friend Gab. He chose an English book about a mighty dump truck and "Anong Gupit Natin Ngayon? ", a storybook written in Filipino. At first, I was tempted to choose books for him and bring the ones he knew by heart. I wanted to mark this year's World Read Aloud Day with Rio "reading" on his own. Walang basagan ng trip, Nanay. Reading aloud should be a happy experience, both for the storyteller and the listener. It should not be done as a reading exercise or a way to review phonics and sight words. Reading aloud should tickle the listener's imagination and inspire him to ask questions and explore more about the story. Rio is interested in any book that deals with machines used in construction sites. We have several Curious George books but we always ended up reading the story of George and the dump truck. There were times when he wouldn't leave the bookstore unless we finish reading (aloud!) "Good night, good night, construction site!". I was not surprised that he chose to bring the Tonka book "Working Hard with the Mighty Dump Truck" over our bedtime story favorite, Mo Willems' "There Is A Bird On Your Head!" We were lucky to still read Gerald and Piggie's adventures because Gab read aloud Willems' "Let's Go For A Drive". Rio brought some of his construction machine toys which are also found in the storybook. The toys - dump trucks, excavators, bulldozers -- made our read aloud session more fun and interesting. The boys even put dried leaves and other dirt in the toy dump trucks to make road building as described in the book more real. Si Nanay pa rin ang nagbabasa. Sa totoo lang, I feel pressured to be a more effective homeschooling mom when I realize that Rio is still struggling to read until now. Some family members would ask if he already knows how to read and I would always feel guilty for not diligently sticking to our letter of the week lessons. I feel guilty for not seriously pursuing a reading program for our preschool homeschool. And in desperation and sadness, I would always wish Tita Fe, my aunt who taught me how to read, was still here to help me teach Rio. 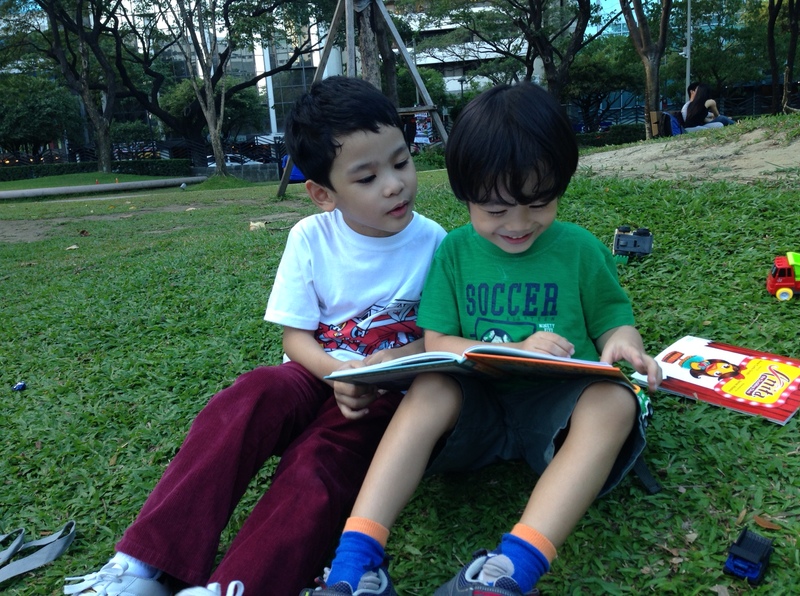 I am thankful for my homeschooling buddy and friend, Queenie and his son Gab (You can learn more about their homeschooling projects here: The Filipino Homeschooler) for joining us in our read aloud date in the park. Our short but fun and meaningful date made me realize two important lessons in our homeschooling journey. 1. Masayang matuto. Masayang magbasa. We chose to homeschool because we want to make learning, especially during these early years, more fun and memorable for our son. We should focus on how to make reading more interesting so Rio would be encouraged to strive to read on his own. 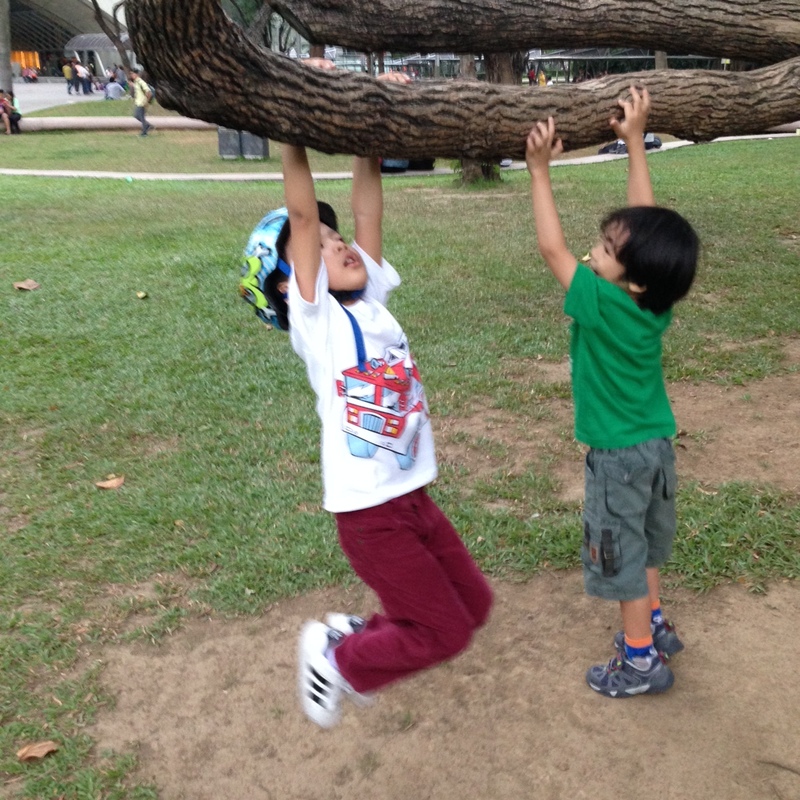 I felt good that our read aloud session turned out to be a play around the park date for the boys too. After reading their favorite books, they ran and played around which made the day more memorable for Rio. 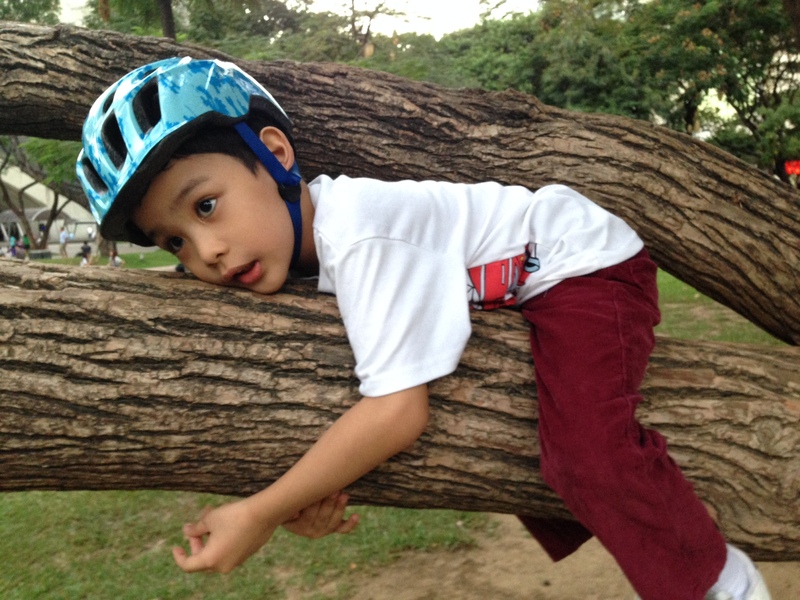 Thanks for this fun playdate, he would associate reading with outdoor play, swinging and climbing tree branches and biking with his friend. We hope that he will find reading an enjoyable experience rather than a forced and structured academic routine. 2. Magbabasa rin si Rio, sa tamang panahon. We chose to homeschool because we want to learn to respect and nurture our child's uniqueness, interests and learning pace. Our read aloud/play around date at the park inspired me to lay down the necessary conditions that will pave way for that "right time" or when Rio starts to read on his own. I also stopped forcing Rio to read during our bedtime story sessions. I have observed that our bedtime bonding gradually became a "reading torture"' when I started forcing Rio to read on his own. It became worse when I shift to beast mode as he struggled to read the more difficult words. Sorry na, anak. During our story time last night, I read most of the lines but he didn't mind when I asked him to read a few words. He would say, "Nanay, it's Rio's turn." and he would confidently read the words. "Rio, look! We finished three books!" My little reader joyfully shouted, "Nanay, ACHIEVE!" Yes, anak. Achieve na achieve! 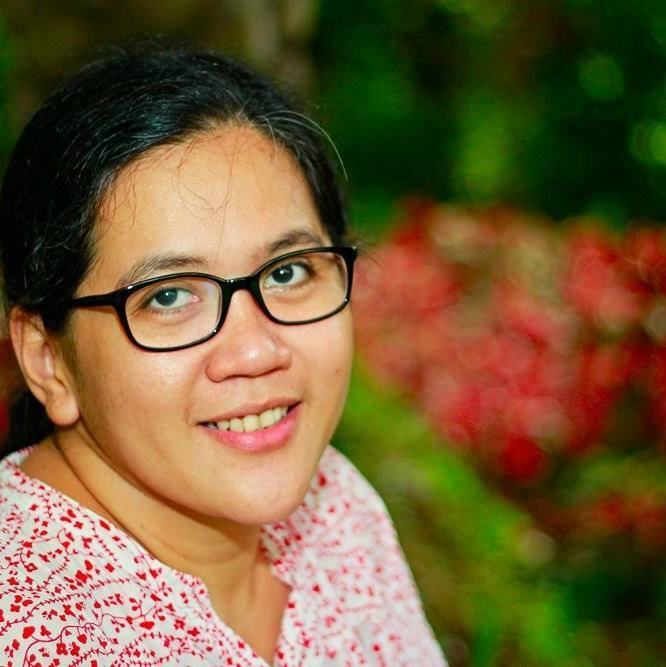 Nanays, how did you celebrate World Read Aloud Day this year? Share your family reading adventures and tips on how to teach our children to read. During our children's early years, parents have the responsibility to choose and buy the right books for their children. I am thankful that I have The Learning Basket (TLB) to guide me in choosing the appropriate books to collect and introduce to my son's developing and inquisitive mind. Check their online book shop and give me some love by clicking this link: Nanay's Trip Project AKLAT to access their online store and purchase books from them. Thanks! 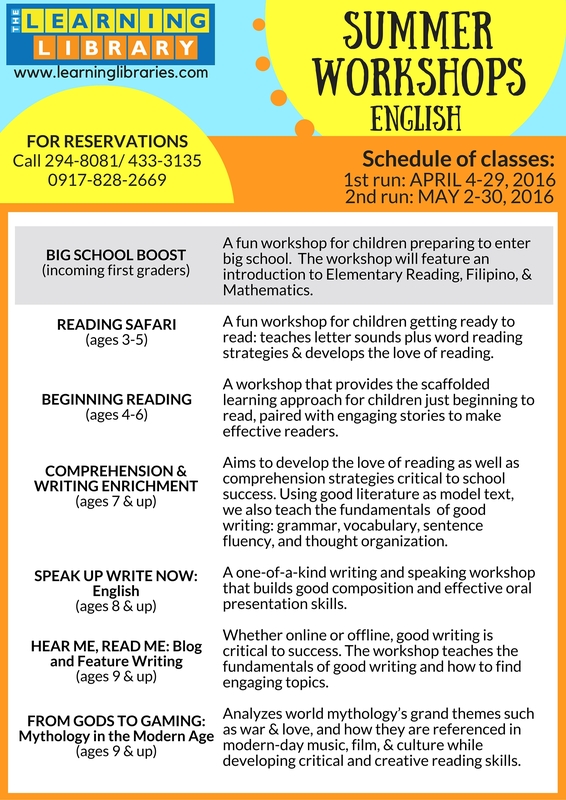 Mga mare, check out The Learning Library's 2016 Summer Workshops schedule. I encourage you to visit one of their centers and listen to their insights on what reading/writing program (English and/or Filipino) is best for your children. Browse through their Facebook page to know more about their works, programs and upcoming events. We are excited to join their summer run this year. I'll write more about TLL's programs in the coming weeks. Oh this is so nice. I have an almost 8-month old. My husband and I decided on homeschooling him as soon as he shows interest na in learning. This is a wonderful activity. I love reading and would love to instill the same with my son. :) I had been reading aloud to him since I was pregnant. Super thank you for the list of the summer workshop. My second son is into mythology and surely he will kiss me (weeee!!!) once I enrolled him there. Again, thank you. My daughter is almost and she likes being read to. This post is very informative! 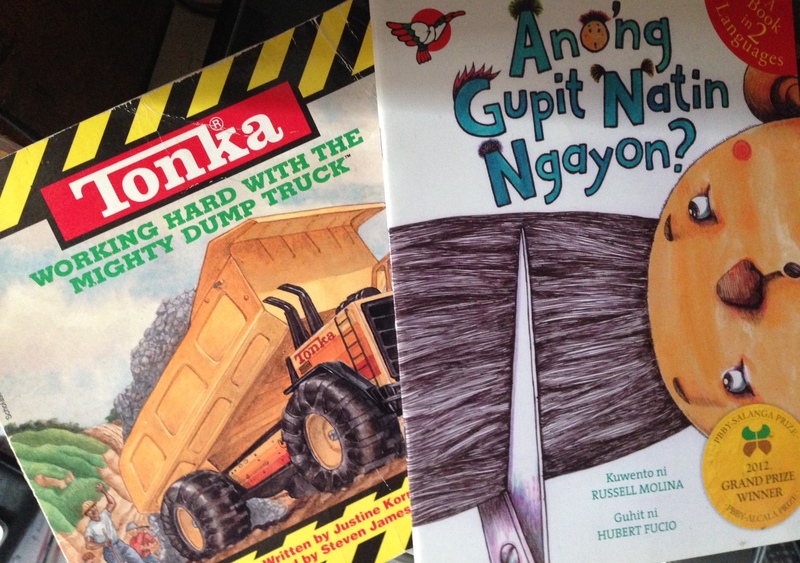 We inquired with the Learning Library for a Filipino class for the kids this summer. We haven't scheduled their assessment yet because they're still preparing for their recital next Saturday. Ang saya niyo naman sa park. In my end, only my eldest likes bringing drawing books and stuff to the park, but oftentimes, they prefer just running around and playing. And since we don't have a yard, I really let them run their hearts out when we're out. Hi Joy! I'm so happy Wynn liked the book. We're in Lesson 13 now. We try to finish a lesson everyday, 15-30 minutes. I hope we can finish the book this June. I can't wait for our next date. Tiyak maraming chika. Take care and see you soon. Hello! Wow, mythology! Ang tagal ko nang gustong magbasa tungkol d'yan. Anong branch ng The Learning Library ang pinakamalapit sa inyo? Lapit na ng bakasyon. Enjoy! Thanks for dropping by. Enjoy the summer vacation and workshops! Thanks for dropping by! Reading aloud to our children in the early years encourages them to explore the illustrations and helps them build their vocabulary. Happy reading! Anong branch pinakamalapit sa inyo, May? 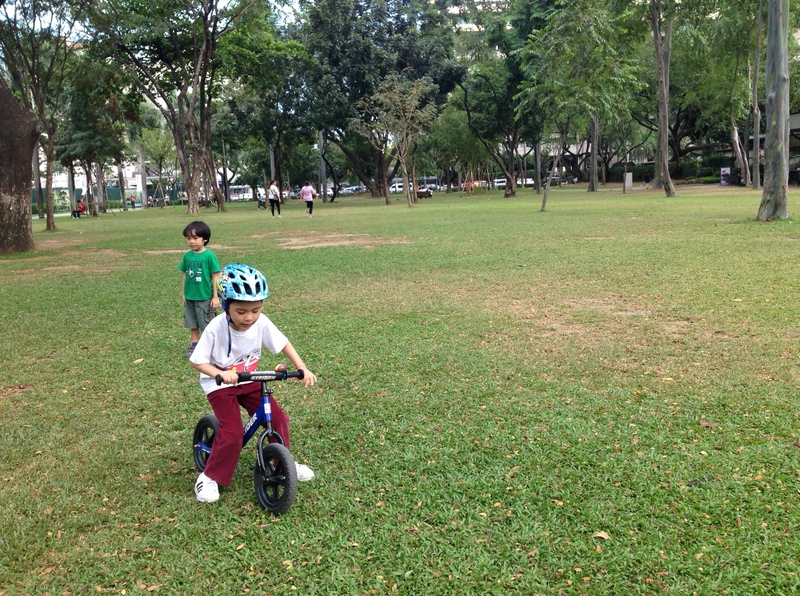 Nag-bike rin si Rio sa park after our short read aloud session. Parks are for playdates - running and playing to sawa. Miss you! 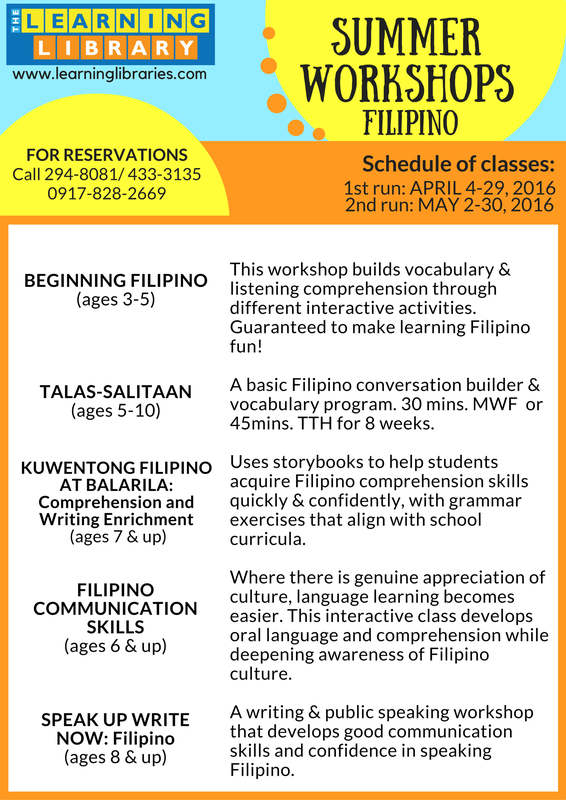 I think my kids would benefit from the Filipino workshops lol. West Avenue in QC pinakamalapit. Showed him the sked and he is looking forward na. Though he told me he wants to play basketball and chess din. Hahaha, dami gusto. Thanks ulit.